The action, as I mentioned, is set in a library at night. Apparently every so many centuries, a collection of alien species has a gladiatorial duel to the death pitting seven contestants against each other, however only one will survive the combat. This contest can take place in different alien locales, but on this occasion, Earth was selected. Physician Stephen Swain and his young daughter Holly are sucked into this contest unwittingly (everyone is “beamed” inside), but once within the library, they can’t escape. With little chance of being able to defeat the other, much more powerful alien warriors, Swain can only hope to survive, or at least make sure his daughter does. Fortunately, along with all of the other combatants, he has been provided with an alien adviser who helps him understand the rules and what to expect out of each of his opponents. While the novel is “action-packed,” it is also stretches credibility to the extreme. The previous evening, someone had broken into the library to steal some computer equipment. That thief was literally torn in half by one of the aliens who had arrived for the contest early. The police cordoned off the area permitting no one inside until a full investigation can be made, but Reilly places two police officers in the library to “guard” it for the night. Further, they are left without any ability to communicate with the police station. Both of these actions would be totally unheard of in actual police work. And on top of all that, the officers separate within a multi-floor, darkened building again, with no ability to communicate, and one is messily murdered. That would never, ever happen. Swain, who has been getting advice from his personal alien, saves the other officer who is confronted by one of the other-worldly warriors, by convincing him to put his firearm on the floor so they can all escape. No police officer, even a green-as-grass rookie, would obey the commands of a civilian and relinquish his handgun under any circumstances. While each of these aliens is depicted as far more powerful than a human, amazingly, Swain survives attacks that have crippled or killed the other, stronger beings. He also managed to escape and then get back inside (he’s wearing a wrist device which will explode, killing him, if he leaves the field of combat for over a certain amount of minutes before all of the other fighters have died) an impenetrable force field through a pretty lame flaw in the technology. All’s well that ends well by the final chapter, and I know between 1996 and 2000 when the novel was republished, Reilly had made some significant improvements in the book, but his editors should have been a little more attentive. On the other hand, his second novel Ice Station looks pretty interesting, although my advice to this author would be to stick to characters and locations with which he’s more familiar. I don’t see any problem with him writing an action thriller set in Aus. 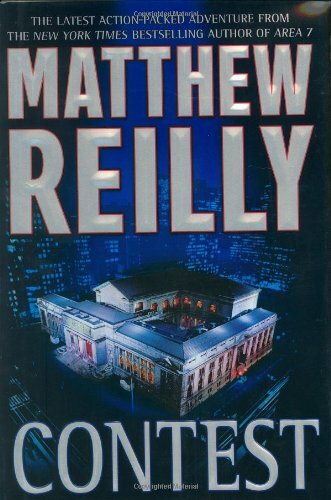 Have read all Matthew Reilly’s books, and Ice Station is the first with Scarecrow in it. The subsequent ones are all good and fast moving IMO, though for me the technical stuff is way over my head. I looked at his works in general and the consensus among reviewers is that he knows how to write fast-paced action, but his stories almost always stray heavily into the area of incredibility. I liked Contest as it was different to the stuff I usually read. His other stuff is fast, I enjoyed the pace, probably so much that the incredibility stuff ent over my head too with the techno. Good reads for me though. Well, he’s an internationally bestselling author, and his reviews are generally good, so he’s obviously doing something right.